Pyramid Flatwounds for guitar nails the sound of the much loved British beat groups of the 1960's. Indeed flats were the common string type used during that era, and country players, surf bands, rockabilly acts and jazz players all commonly used flatwound strings too. Great musical tone is not all you get with Pyramid Golds. You get great feeling smooth strings with less finger noise, and you'll be able to accomodate lower action on your guitars. Excellent for all types of music, brilliant with the warmth of pure nickel wound in silk ends, Pyramid Golds give you a flatwound with "twangy" lush upper harmonics, long sustain, extremely long life, great smooth feel and perfect balance. 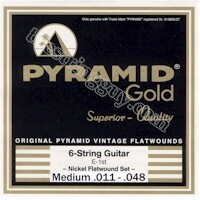 Try Pyramid Gold Original Nickel Flatwounds. You will be convinced.